Projected growth in the retail market, upcoming new hotels & shopping malls, demand for packaged food items along with increasing FDI inflow in the construction and retail sectors are some of the key factors shaping cold storage market in Saudi Arabia. In Saudi Arabia cold storage market, the retail cold storage vertical segment accounted for highest market revenues owing to availability of supporting infrastructure and increasing installation in organized retail units, particularly, hypermarkets and supermarkets. In Saudi Arabia, the Central region held majority of the Saudi Arabia cold storage market share in terms of revenue on the back of increasing infrastructure development activities, especially in the industrial & manufacturing verticals. The Central region is expected to maintain its market share during the forecast period as well. 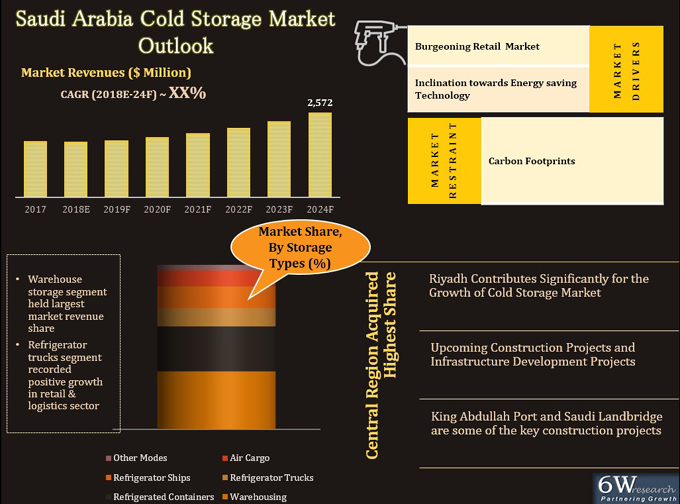 The Saudi Arabia cold storage market report thoroughly covers the market by cold storage types, technology, verticals, end-user and regions. The Saudi Arabia cold storage market outlook report provides an unbiased and detailed analysis of the Saudi Arabia cold storage market trends, opportunities/high growth areas and market drivers which would help the stakeholders to device and align their market strategies according to the current and future market dynamics.